The What: Crestron launched its new DMPS3-4K-350-C and DMPS3-4K-250-C 3-Series 4K60 DigitalMedia Presentation Systems at InfoComm. The new models add built-in Crestron AirMedia (AM-101) for wireless presentation functionality and a higher-powered amplifier, as well as 4K60, full support for HDCP 2.2, and Control Subnet. The What Else: Like other DMPS3 Series models, the DMPS3-4K-350-C and DMPS3-4K-250-C include a built-in IP-based 3-Series Control System. Setup and touchscreen control are carried out through the web-based configuration tool, with no programming required. The AirMedia gateway built into the DMPS3-4K-350-C and DMPS3-4K-250-C enables wireless presentation of content from a laptop, smartphone, or tablet device via the room’s Wi-Fi wireless network. The DMPS3-4K-350-C and DMPS3-4K-250-C also feature scaled HDMI outputs to transmit any resolution source to any resolution display. In addition to the LAN port, each model has a built-in Control Subnet port, which enables deployment of a separate DM network. This makes system updates and troubleshooting faster, and requires just one IP address to connect the entire system to the LAN. The DMPS3 Series models are designed to meet all audio distribution needs. 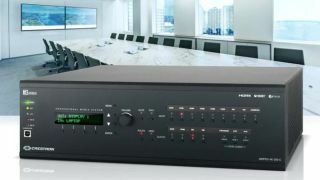 In addition to the built-in audio DSP and codec mixing, they provide breakaway audio routing, surround sound pass-through, six-channel mic mixing, and a new higher powered integrated amplifier than other DMPS3 Series models, enabling it to directly drive a pair of stereo speakers (25 watts RMS per channel at 8 ohms, 4 ohms tolerant), or a group of distributed ceiling speakers (50 watts RMS at 70 or 100 volts). The Bottom Line: The DMPS3-4K-350-C and DMPS3-4K-250-C combine DigitalMedia technology with an IP-based 3-Series Control System, 4K60 multimedia switcher, mic mixer, and audio DSP in a single rack-mountable package. DMPS3 Series deliver bit-for-bit HD video switching and display, including HDCP 2.2 protected content.